Sally Hansen DS Wedding Crasher - Polish Etc. I'm normally not a huge fan of Sally Hansen polishes. They are great basic polishes, good price, good wear, broad color selection... but I rarely find that color that makes me go wow. 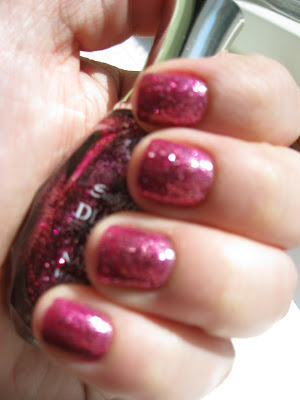 That is, until recently when I tried out Sally Hansen Diamond Strength Wedding Crasher. It is a dark pink/magenta jelly base with small pink glitter. 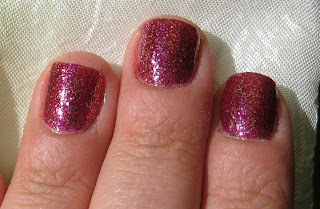 Wedding Crasher is packed with glitter, but still required 3-4 coats to reach opacity on its own (as well as two thick coats of top coat for a smooth finish). It would make a great layering polish and would look great layered over a pink or magenta polish, however I LOVE it solo. This one is totally worth the time that the mani took to perfect. ... and a blurry one just to show the gorgeous sparkle. I picked this one up because it just looked too good to be true in the bottle, especially unique for a SH polish. Wedding crasher exceeded my expectations. 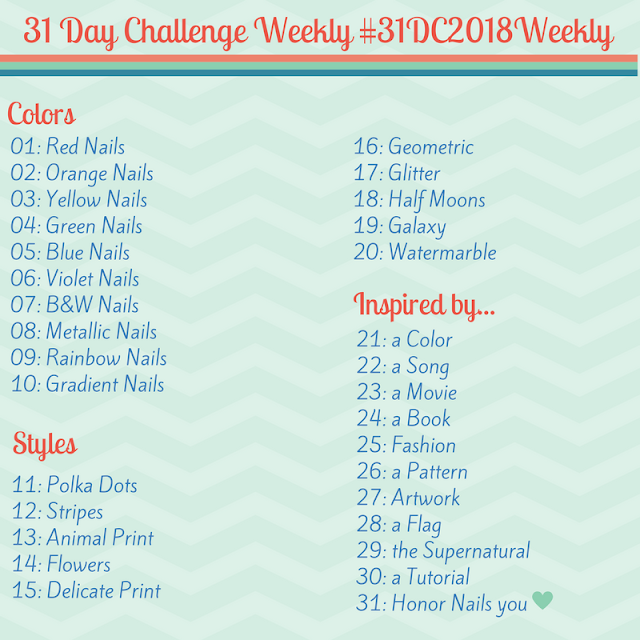 So far it's been two days of no chips (for a glitter polish!) and such a great color! I love it.